Preventing and fighting post-surgical infections, antibiotic-resistant infections and sepsis. Treating cardiovascular disease, lowering cholesterol and reversing arteriosclerosis. Stimulating the immune system to destroy cancer cells. Speeding tissue regeneration and repair, particularly stimulating wound healing of diabetic and venous stasis ulcers. Enhancing the formation of white blood cells (hematopoiesis) in patients undergoing radiation and chemotherapy or recovering from bone marrow transplants. Creating targeted drug- and antigen-delivering systems. Beta glucan works to stimulate the two main components of the body’s immune system, the innate and the acquired immune systems. In the innate immune system, beta glucan binds with the macrophages, a type of white blood cell whose job is to detect bacteria, viruses and other pathogens and coordinate the body’s defenses against them. When activated by beta glucan, macrophages have an increased ability to identify and destroy foreigner intruders. After devouring pathogens through a process called phagocytosis, the macrophages then communicate the intruder’s presence to the body’s other defenders. 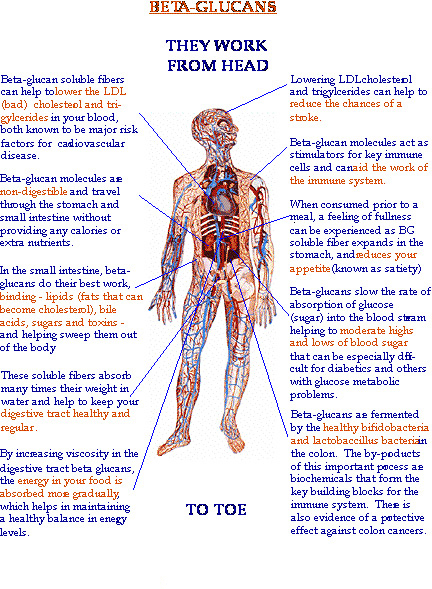 Research shows that macrophages fortified by beta glucan are better able to rally the body’s defenses. Now the acquired immune system joins the fight. Using the information transmitted from the macrophages, the acquired immune system learns to manufacture other killer cells and blood factors designed to defend against a specific attack. These include B-cells, which produce antibodies and killer T-cells. The antibodies, working with the innate immune system, destroy foreigners and bind them into clusters, which are then engulfed by macrophages. This is how the body rids itself of infection and disease. The healing and immunostimulating properties of mushrooms have been known for thousands of years in the Eastern countries. 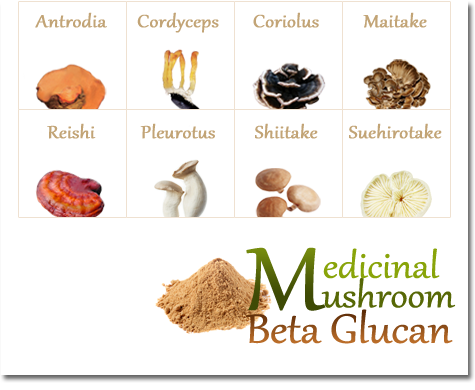 These mushrooms contain biologically active polysaccharides that mostly belong to group of beta-glucans. These substances increase host immune defense by activating complement system, enhancing macrophages and natural killer cell function. Increased interest in β-glucan in the last two decades arises from its functional and bioactive properties. Of all fibers, its health benefits have been the most extensively documented, and the use of health claims with β-glucan-containing foods has been allowed in several countries including Canada, the United States of American, Sweden, Finland, and the United Kingdom.